Landana is prepared according to the age-old tradition of master cheesemakers. Landana is a leading, renowned high-quality cheese from Holland, loved for its unique taste, its excellent quality and its many delicious varieties. With its extensive product range, Landana can satisfy the needs & wishes of virtually all cheese lovers out there. From traditional cheeses to various special herbed goats’ and sheep milk cheeses. The art of cheesemaking is passed on from one generation to the next and has hardly changed to this day. In its cheese warehouses in the Green Heart of Holland, Landana cheeses mature on untreated wooden planks. During the process, these hand-turned cheese are closely monitored by our master cheesemaker, until they have reached Landana’s demanding quality standards. 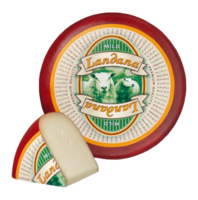 Landana Sheep milk cheese is gluten-free and low in lactose (lactose <0.1 g / 100 g).